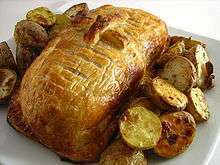 Similar dishes of meat baked in pastry include sausage, salmon and a vegetarian mushroom Wellington. Beef and lamb wellingtons are a popular main course dish in the American reality show Hell's Kitchen, hosted under head chef Gordon Ramsay. 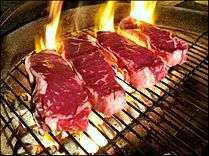 Because it must be baked and carefully cut for the presentation, it is one of the dishes that can be easily overcooked or undercooked. The Modern Family character Jay Pritchett's favorite food is Beef Wellington. In the King of the Hill episode "I Remember Mono", Peggy Hill (née Platter) attempts to fix her boyfriend, Hank Hill, Beef Wellington as part of a Valentine's dinner, but her efforts prove to be insufficient and she never completes the meal. 1 2 Hyslop, Leah (21 August 2013). "Potted histories: Beef Wellington". The Telegraph. Retrieved 14 May 2015. 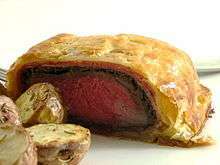 ↑ "Classic Beef Wellington". Tiny New York Kitchen. Retrieved 14 May 2015.